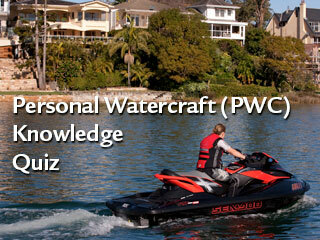 Select which type of knowledge quiz you would like to complete General Boat or Personal Watercraft (PWC) by clicking on the appropriate image below. This quiz mimics the actual Boat Driving Licence Knowledge Test and you will be presented with random questions taken from the actual test question pools. 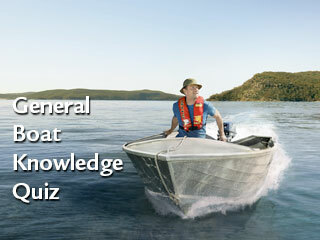 The General Boat Driving Licence Knowledge Quiz consists of 50 questions divided into Part A and Part B. Once you have selected the test you wish to complete click on the Right Arrow to move into the quiz. In Part A of the General Boat Quiz all 20 questions must be answered correctly. In Part B of the General Boat Quiz you are allowed six (6) incorrect answers. If you get a question wrong you may continue but the correct answer will be shown. In the PWC Knowledge Quiz you are provided with 15 questions to answer. Twelve (12) answers must be answered correctly. At the end of the knowledge quiz you will have the option to review the section of the Boating Safety Handbook in which your answers were incorrect. © 2019 Boating Knowledge Revision Quiz. All Rights Reserved.